The Seek Thermal camera comes in a nicely packaged box which includes a compact storage case. The gallery below shows the packaging and the camera housing. The housing is made of magnesium and the lens has a 36 degree field of view. The camera is quite lightweight at 0.5 ounces. In terms of dimensions, the unit has a length of 2.75", depth of 0.84" and height of 0.84". The Android version of the camera works on any Android device with a micro-USB port supporting USB OTG (On-the-Go) where the USB port can be in the host mode. Unfortunately, Android phones don't have a standard orientation or placement for the microUSB port. On the HTC One M7 and M8, for instance, the thermal camera tags on to the phone facing the same side as the screen. With the LG G2 and Samsung Galaxy phones as well as the Dell Venue 8 7000 series tablet, there were no issues in getting the orientation of the camera right. The Seek Thermal Android app has gone through multiple feature updates and bug fixes over the last few months. In the initial days, the app would consistently crash, but it has recently been rock-solid on the multiple devices that I have tested it with (LG G2, HTC One M7, HTC One M8, Samsung Galaxy S4 and the Dell Venue 8 7000). The gallery below shows some screenshots of the app in action on a LG G2 back in November. Note that we have emissivity control - i.e, the software is aware of the efficiency with which infrared energy is radiated depending on the material. This helps in determining the correct temperature of the material. The reference 'black body' has an emissivity of 1. The Seek Thermal camera has a shutter that passes in front of the lens periodically for recalibration based on the surrounding temperature. This makes a clicking sound which is frequent during the initial usage. After warm-up, calibration frequency is reduced. In any case, this emissivity control seems to be missing in the latest screenshots taken while the app was running on a Dell Venue 8 7000 tablet. The various interesting aspects of the app are evident in the screenshots above. It is possible to take still images as well as videos. In the latter case, 16:9 settings provides us with 720p video at 13 fps, while 4:3 gives us a 832 x 624 video at 14 fps. However, the real frame rate is less than 9 fps due to export restrictions on VO-based microbolometers. The photo / video can be in different thermography modes - normal (regular thermal images), spot (average temperature around the center spot), high / low (highest and lowest temperatures in the focus area) and threshold (different color for temperatures above/equal to/below a particular temperature). PC builders and DIY enthusiasts are not in the list provided by Seek Thermal. 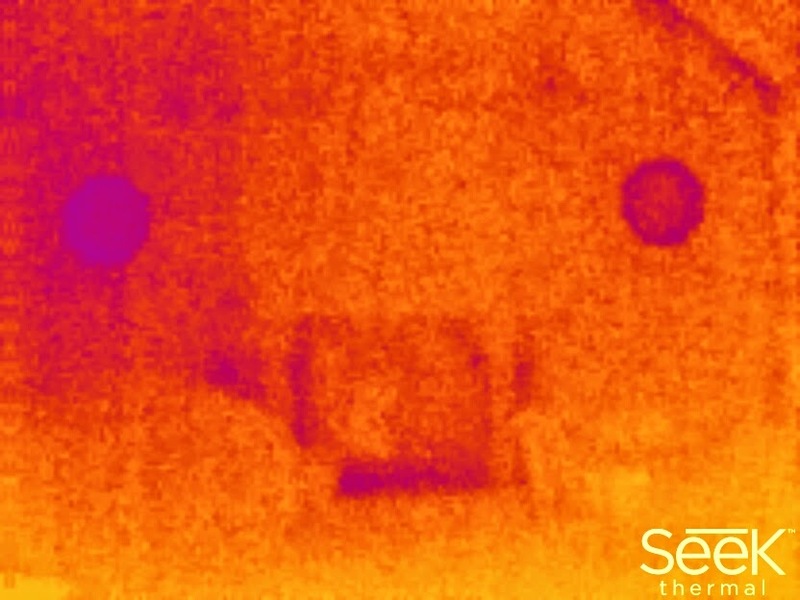 However, regular readers of our passively cooled PC reviews must have seen seen photographs from the Seek Thermal camera in the thermal performance evaluation section. The camera provides an affordable way to monitor the temperature of the chassis in order to ensure that things are not overheating and creating a hazard. Holy smokes, yes. Nothing says "this would be useful" than screenshot after screenshot of nearly uniform orange backgrounds. This is the wall around my fireplace. 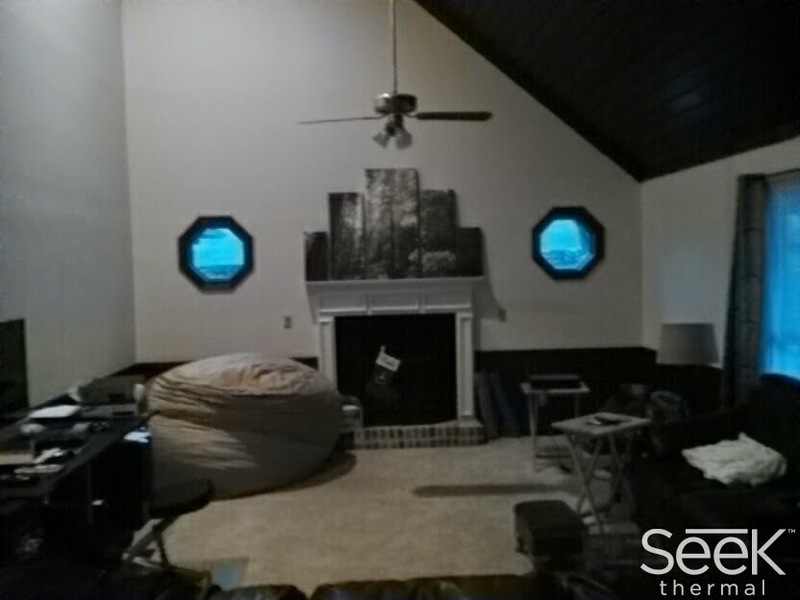 You can see the two porthole windows and the stone hearth as being cooler than average, but the rest looks okay. There's a little more loss in the corner on the right going up the cathedral ceiling, too, but not much I can do about that. The FLIR was interesting in that it would combine the visible photo with the thermal photo and use the higher resolution visible image to enhance detail and overlay some thermal information. I think the sensor in that camera was actually lower than this one, so you actually get less thermal data (assuming similar quality sensors), but it's processed into something much prettier.